Follow these simple steps to properly clean paint brushes after your next do-it-yourself project. An investment in high-quality paint brushes is wasted if they are not properly cleaned and stored after use. Indeed, rushing through the end of a paint job can leave you with flecks of paint in your brushes—which will lead to an imperfect finish on your next project—as well as misshapen bristles. So invest the extra two minutes it takes to do the job right and follow this guide on how to clean paint brushes. Use up what paint remains on your brush on whatever you are painting. Press the bristles against the inside of the paint can, and lift it up and out as you do—that will squeeze out more paint. Paint away the rest on newspapers, because cleaning a brush is made easier if you remove as much of the paint from its bristles as possible. Next, examine the can of paint, and use the appropriate sol­vent. Immerse the paint brush in the solvent. Stir the solvent with the brush for about 10 seconds, wiping and squeezing the bristles on the sides of the container. Work the bristles between your fingers, and run a brush comb through them to remove excess paint without damaging the bristles. 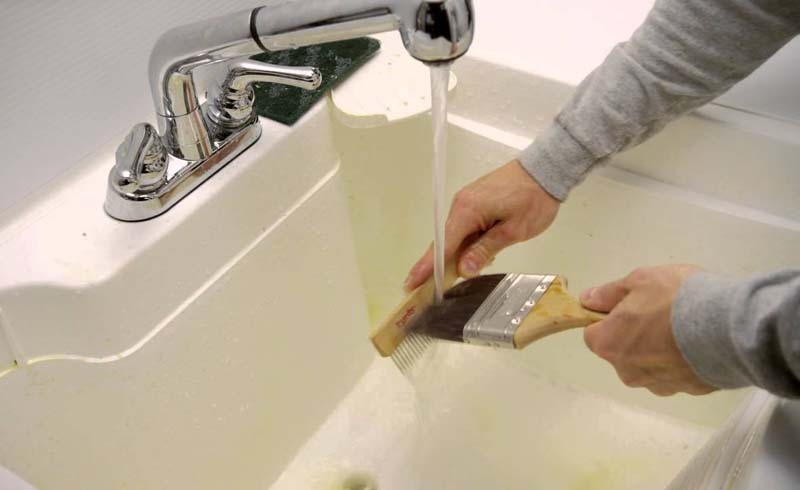 If some of the paint has begun to dry on the brush, soaking the brush may be necessary. Wash it in warm soapy water in a utility sink or bucket. Once the paint has been removed from the brush, warm soapy water will clean the brush of the sol­vent and remaining paint. Shake or spin the paintbrushes dry. 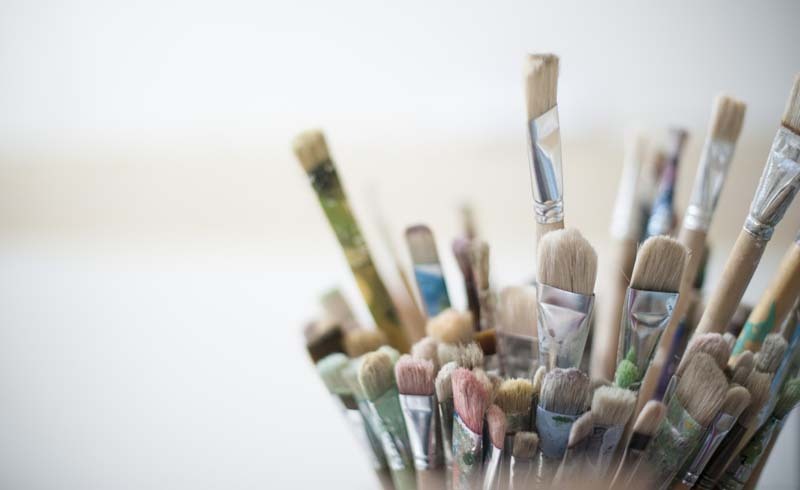 Before you store your paint brushes, you’ll want to remove all of the water from their bristles. Many DIYers will do so by shaking the brush at the top of a bucket and then blotting the brush dry with a clean rag or news­paper. But, for those that have plans to do a lot of painting and wish to preserve their tools, a brush and roller spinner will come in handy. This dual-purpose tool will speed-dry either type of paint applicators using centrifugal force. Just attach a paint brush to the bottom of the tool, then pump the top several times to spin it and fling all water off the business end of the brush. When storing paint brushes, hang them up or lay them flat. Hanging paint tools from a pegboard in your workshop or craft room is not only a great organizational method, but it ensures that the brush’s bristles don’t get bent out of shape stuffed in a bin somewhere. Replace the packaging on your paint brush to maintain its form and prolong its useful lifespan.